So why another post? Well I’ve been watching my Dawn Phenomenon (DP), or in some cases, the lack of it, with interest. What’s going on there? As is my normal method, let’s start with a look at some of the research. If you don’t want to start there, then click here to go to my Jerry Springer style summing up! When digging into research about DP, the one thing that becomes abundantly clear is that there are a lot of published research papers linked to DP. This three page ADA paper summarizes pretty much everything available. All of it (type 1 and 2) in three pages. And this Polish paper also provides a lot of useful insight. It is widely known about and well documented (The Polish paper references 50 or so other studies). Basically, DP is your body preparing to get you up and going ahead of waking. 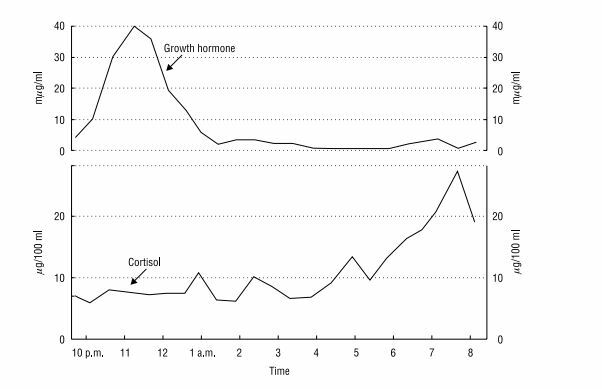 As the following graph shows, the hormone release overnight is what drives DP. According to the research it is the combination of Growth Hormone and Cortisol that drives the DP as both of these are Insulin Antagonistic. 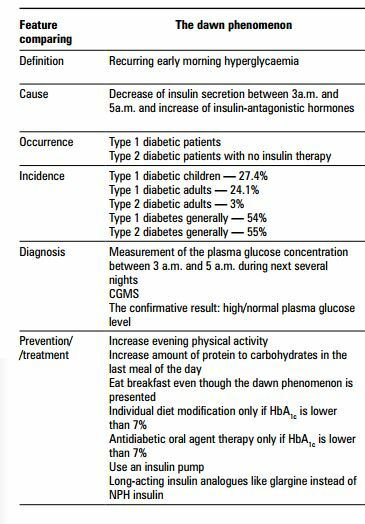 Add to this the overnight situation where the body typically becomes more sensitive to Insulin and you can see how all the factors together result in DP. 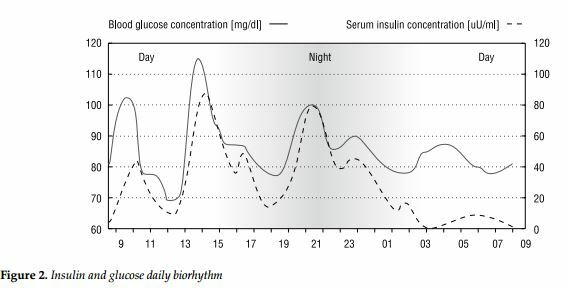 As an aside, if you are starting up on a pump, this graph of insulin serum concentration is perhaps not a bad place to start to understand how basal rates should look without taking DP into account. I’m not going to go into detail about the treatments as these are well presented in the table above. What I do note is that the Polish paper from 2011, as the table suggests, has established that there is a particularly wide variance in the incidence recorded of DP amongst T1s, with population percentages varying from 24.1% to 54% of the T1 population. As they say, more research is probably needed into how many people are really affected. Why am I looking at DP, again? Because I’ve been seeing variation in it that I can’t find decent data on in the research. So let’s take a quick look at the observational data that I’ve collected. These three photos show various aspects of DP over the last three days, and I’ll go into the details of each day to try and explain some of the variance. The three days in question are Monday 16th, Tuesday 17th and Wednesday 18th November 2015. Three different days and three different traces. What do I know about these? On the Sunday, I had eaten a relatively high carb diet. Around 200g of carbs in total. I had done an average amount of exercise (walked about 5,000 steps) and eaten a carby meal late in the day. I went to bed at around 11pm and woke up at 5am. The trace from Monday morning shows a huge spike kicking in at roughly 3am. This is earlier than I would expect and based on reviewing my sleep data, I had been disturbed at around this time. On the Monday I had reverted back to a much lower carb diet, eating a total of about 50g of carbs all day. I had a gym session from 5.30 to 6.30 (as detailed in my day in the life post), had a single piece of Rye Bread with no insulin due to the gym session earlier at roughly 9.30 and went to bed at about 11pm. I then got up on Tuesday morning at 5am. 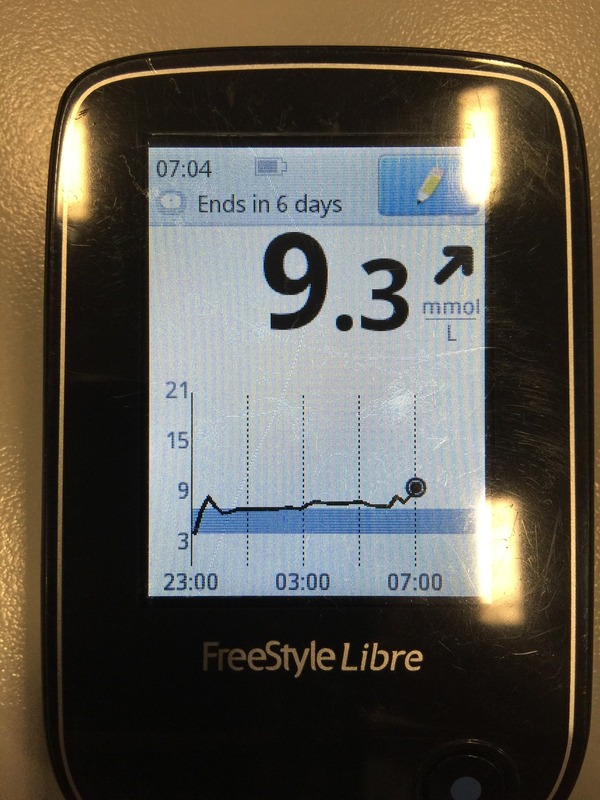 This shows a flat all night trace which I decided was a little too high so I corrected myself down and then ate approximately 6g of glucose at around 6.30 to ensure no low. On Tuesday, I maintained my low carb diet and went to the JDRF event in the City. I didn’t drink alcohol. I went to bed an hour later at 12 midnight. following a slightly later return home. I ate a slice of rye bread at around 11pm with 1.5u of insulin. 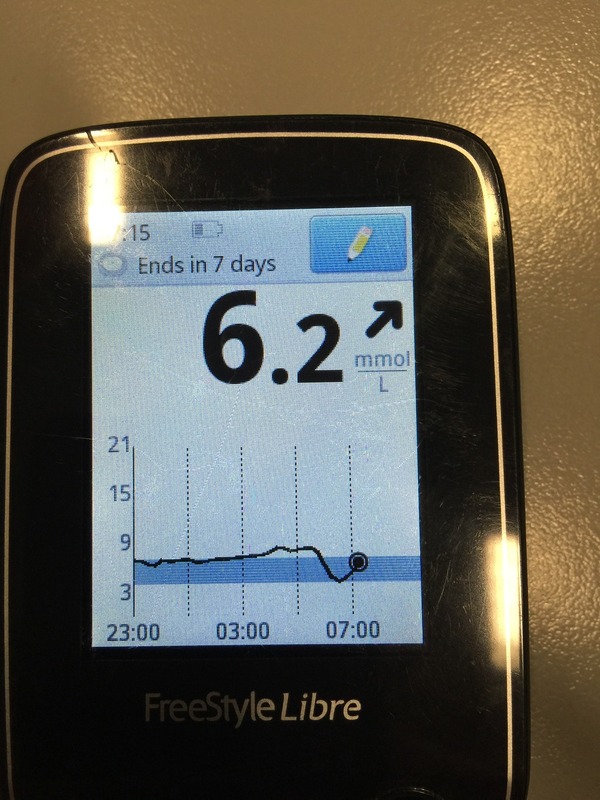 This also shows a flat trace all night and then from 6.30am, glucose levels started to rise. Although the picture doesn’t show it, they rose to nearly 10mmol/l in spite of a 2u correction dose at around 6.45. Three different mornings, with slightly different results. Three different days and evenings preceding those results. These three examples seem to reflect the majority of my experiences although, for consistency purposes, there should also be an example of normal bed time, low carb day. Based on the above ramblings, the scenarios I’ve found, since I’ve been reviewing are reasonably clear cut. When my body is adjusted to carbs, I nearly always get pronounced DP, as I am expecting glucose to get me going. When I am adjusted to much lower carbs, the effect here is much less. I see about 50%-65% of full carb DP but not the extremes of Monday morning. When I have exercised in the evening and am low carb, it is almost non-existent. But it gets a little more complex than that. as can be seen from the Tuesday night example, if I go to bed later than normal, my DP is delayed, and as seen this morning, the delay isn’t necessarily in line with the delay in getting to bed. It seems related to how tired I am before I go to bed. 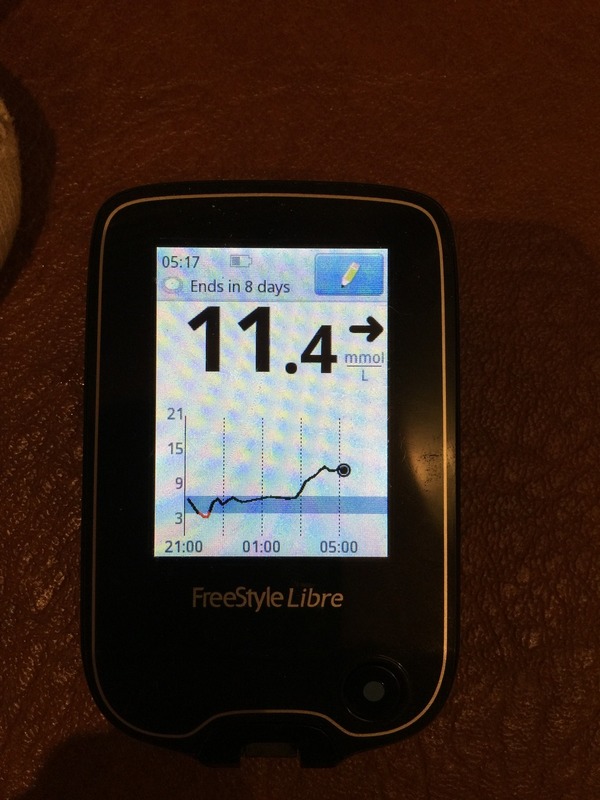 In addition, when I get a later onset, it seems to last longer with significantly more upwards pressure on my glucose levels over the course of the morning. So what am I getting at? Well, with the pump, I should in theory be able to set a basal rate to manage for DP, and indeed, my basal settings, to some extent, increase from around 2am. What a pump can’t do is react to stimuli that occur in the sleep causing changes in timing of DP and trigger additional insulin, which I would need on the Sunday night example. While DP is well documented on a population basis and strategies for dealing with it are easy to obtain, as the initial table demonstrates, at an individual level it can be more complex to deal with. It all comes back to the three Rs. Record, Review and React. Otherwise it’s extremely difficult to see what’s going on. To make this process easier, linking CGM data to a form of activity data may allow a better link between the impact of exercise and extent of DP. In addition, careful documentation of food intake into the same system may also improve the predictive nature of such a set-up. As a result, a self learning indication algorithm may allow a T1D to select different basal rates based on the various inputs and ultimately select them itself. Either that or a closed loop system will simply manage that for you! After all, as it stands, even as a Cyborg Pancreas, Sugar Surfing in your sleep remains difficult!